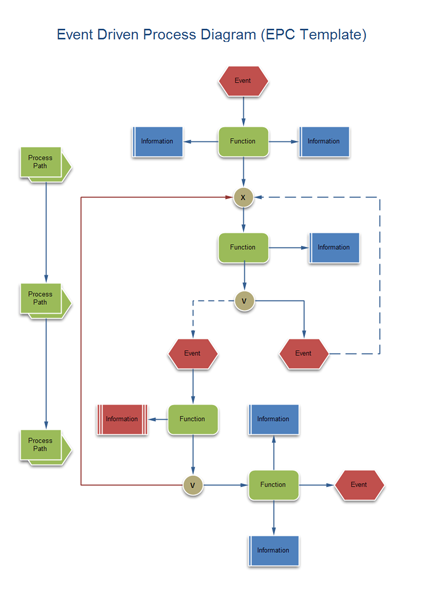 Easy to create Event-driven Process Chain (EPC) diagrams to document business processes through Edraw. Document SAP processes. It can also make flow charts, organizational charts, business process, workflows, program structures, network diagrams, chart and graphics, mind map, directional maps and database diagrams. 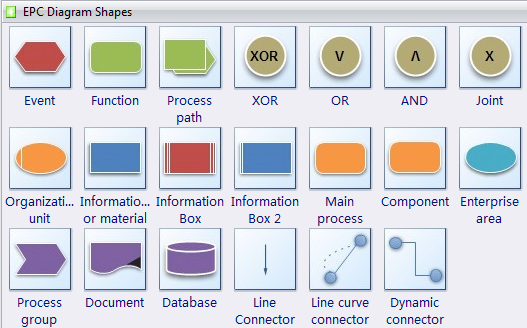 With the pre-drawn libraries and more than 4600 vector symbols, drawing has become super easy! Edraw symbols were designed for the EPC, too. An EPC can be used in process analysis for more complex structures and is more suitable for bigger enterprises. An EPC can be used in cases when we describe a process model with no need for further analysis of events and functions. Therefore, a complex process structure is possible. EPC represents a core-procedure of a process and is most suitable for describing a complex process structure of a big enterprise. An EPC model, presents not only core functions of process but also give us possibility to represent who and which organizational unit executes a function, which input data are necessary, which output data have been created by the function. EPC is missing all those insights about the business processes. Therefore, an EPC can be used in business process model regarding the information flow, thus, it is very difficult to recognize media interruptions because this presentation focuses on events and functions. Therefore, an EPC is very suitable for describing information and events/function business analysis in enterprise.